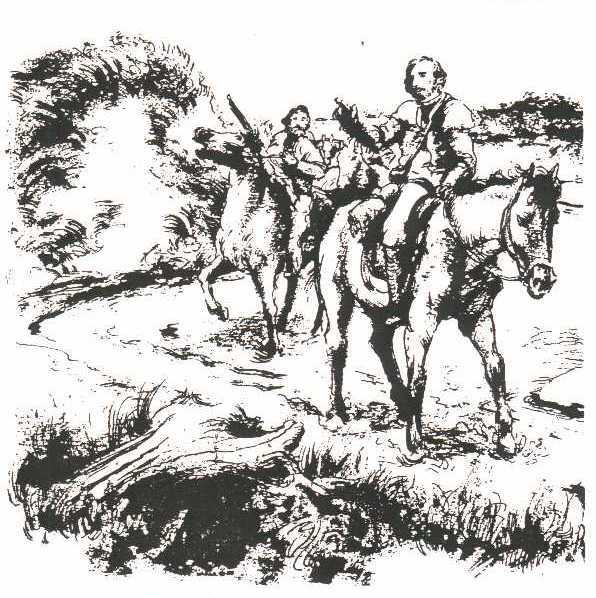 History: The original Jedediah Smith 1828 Expedition traveled north up the southern Oregon coast moving along the shore with his slowly dwindling number of half-wild horses and mules, originally numbering about 300 head! He had to wait for low tide to cross small rivers, and rocky bluffs often forced him inland. Therefore, the presence of equestrians traveling along with members of the Millennium Expedition while enroute will enhance the historic accuracy of the event itself. Equestrian Use: Today, equestrians may travel part of the Jedediah Smith Trail by simply accessing and traveling along various sections of beach from Crescent City, California to Winchester Bay, Oregon. However, when riding or hiking along any beach safe access to and along it means being aware of changing ocean and weather conditions and the daily tidal fluctuations for any specific day. Therefore, in order to help you to "connect" with the expedition while enroute when planning an equestrian activity, program, or event hosted or sponsored by an individual, a group of riders, or an equestrian organization the following information is provided as a preliminary basis for your planning needs. Important Note to Members of the Media: Although we have requested equestrian participation, the following calendar's intent is simply to provide an opportunity for this user-group to connect with the millennium expedition, and does not indicate equestrian commitment to be there on the dates or during the times listed. Daily times should be viewed as approximate; actual times may possibly be earlier, and probably later than those indicated, with greater potential variation later in the day. Of course, starting times for equestrians to connect with the expedition at around 9 or 10 AM probably provide the best "on-time" opportunity to photograph equestrians, provided they participate. We will list equestrian activities, programs, and events done in conjunction with our millennium expedition on our website if we know of any planned commitments for your information and planning. EQUESTRIANS AND MEMBERS OF THE MEDIA TO CONNECT WITH THE EXPEDITION WHILE IT'S ENROUTE, AND NOT FOR PUBLIC INFORMATION. Purpose: There are various opportunities for equestrians to have their own activities, programs, and events in conjunction with the Jedediah Smith Millennium Expedition. Therefore, in order for both equestrians and the media to "connect" with the expedition while enroute, "The Equestrian Connection" Calendar has been created with the exact dates and the approximate times during these specific dates the expedition will be traveling along beaches. Specific access points have been noted from which it would appear logistically feasible to drive horse trailers, park them, and saddle-up your horses to meet us enroute and join us for a time. Access from the parking areas to the beach will be easier in some places than others, and sometimes may involve fording rivers along the way to connect with us. We cannot guarantee that access down to the beach, across rivers, vehicles, or anything else is safe -- this judgement call must be your responsibility and we encourage you to be safe at all times. Information about overnight horse camps with Oregon State Parks and with the U.S. Forest Service at the Oregon Dunes National Recreation Area is available by contacting these agencies. Many of these sites can be reserved, and we advise you do so as soon as possible if you want to successfully participate through camping. Of course, if you decide to simply show up on the day the expedition will be along a certain section of beach and use a day-use area access point then reservations would not be necessary. Other information has been included such as "routes" and distances which should be useful for planning purposes. The expedition will keep to this schedule in terms of specific dates, although specific times may vary somewhat depending on our progress during the day. The very presence of horses along the trail will enhance the historic accuracy of our event, and this is one reason why we have provided this information. Disclaimer: We cannot guarantee the accuracy of the information provided or the personal safety of those using various access points, traveling the beach, or fording rivers. We recommend that all these aspects either be field checked or discussed with those who have direct experience and knowledge of specific areas through their jurisidiction or management. Also, those considering fording rivers, accessing, or traveling any beach by horse need to assess their abilitiy and the safety of doing so, and are solely responsible for their decisions. We recommend riders always consider their personal safety at all times, and if any activity is not safe or has the potential of not being safe, then not to engage in it. Again, we cannot guarantee that access down to the beach, across rivers, vehicles, or anything else is safe -- this judgement call must be your responsibility and we encourage you to be safe at all times. Technically and for practical legal purposes, equestrians will be hosting and sponsoring their own events, and are responsible for all logistics. Please be aware that the media will potentially take pictures or videotape equestrians while traveling along public beaches and trails, and, of course, use them in newspapers, magazines, or on television. Access: Windchuck River Wayside Directions: About 2 miles south of Chetco River Bridge on Hwy 101 after passing Pedrioli Drive on the ocean side of the highway an unmarked entrance to a potholed dirt parking area along the north bank of the Windchuck River is the wayside itself. Times to connect: 10 AM at the North Bank of the Smith River for opening ceremonies, then up the beach until 1 PM when the expedition expects to reach the south bank of the Windchuck River. This means you'll have to leave the Windchuck Wayside well before 10 AM if you want to witness the opening ceremony, depending on how fast you choose to ride. Note: This will be our only day in California and will be an excellent opportunity to not only to connect with us as we begin our expedition but also enhance both the historic authenticity and the expected media coverage of the event by having equestrians present. Ride: "North & Back" total 3-mile roundtrip accessing the beach on the north bank of the Windchuck River, traveling 1.5 miles north to McVay Rock State Recreation Site and Beach, and returning 1.5 miles south the way you originally came. Note: No access at McVay for horses, only people, to parking lot above McVay Beach. Access: Curry County Fairgrounds Beach Access Area Directions: As you travel through the city of Gold Beach along Highway 101 watch for signs leading you to the Curry County Fairgrounds. Located on the west side of Highway 101 access the road leading along the fairgrounds southern boundary and access the road paralelling the beach by turning north where you will quickly discover restrooms and beach access. Ride: Although there are a variety of options for riding to connect with us on this day, the best opportunity to connect with us as early as possible will be about 3.5 miles south of the fairgrounds access area. This would be a "South & Back" total 7-mile roundtrip accessing the beach at the Curry County Fairgrounds traveling 3.5 miles south to an un-named creek (about 2 miles south of Hunter Creek), and returning 3.5 miles north the same way you originally came to arrive at the fairgrounds access area. Another, but later in the day, option 2, would be to meet us near the fairgrounds access traveling north to the Rogue River and do a "North & Back" ride of about 2 miles roundtrip. The final major option would be a "Combination Ride" of the first two options either ending your ride at the fairgrounds access, or at the south bank of the Rogue River where there's also access to the beach. Note: The stretch of beach south of the fairgrounds is relatively isolated with great views of Cape Sebastion in the distance, provided it's a clear sunny day! You could proceed further south along the beach beyond the un-named creek another 1 mile, however, you might miss the expedition as it came down from the north side of Cape Sebastian to access the beach. Perhaps having lunch for yourself at the un-named creek would be a relaxed way to wait for the expedition's arrival on the beach. Access: North Bank Rogue River Beach Access Parking Area Directions: At the north end of the bridge on Highway 101 access the local road down to and along the north bank of the Rogue River. Turn into what may be an unmarked parking area and then access the beach with your horse. Ride: "North & Back" a total 6-mile roundtrip accessing the beach at the parking lot on the north bank of the Rogue River near Doyle Point at the north jetty, traveling about 3 miles north to Otter Point, and returning 3 miles south the same way. Note: This stretch of beach takes you along cliffs and to a rocky point. Access: Ophir State Wayside Directions: North of Nesika Beach about 2 miles you can access the beach at this wayside along the west side of Highway 101. There are restrooms here. Ride: "South & Back" a total 3-mile roundtrip accessing the beach at the parking lot, traveling 1.5 miles south and just north of Nesika Beach access, returning 1.5 miles north the same way you originally came. Option 2 is a "North & Back" ride as a total 5-mile roundtrip beginning at the Ophir Wayside itself and ending at the base of rocky Devils Backbone extending into the Pacific for 2.5 miles, and then return 2.5 miles back to the wayside itself. Of course both options could be combined into a "Combination Ride" totaling 8 miles roundtrip for the day. Note: Option 2 travels a stretch of beach that takes you along open pastures, across two creeks, and to a rocky point. June 30 - Friday - NO "Equestrian Connection" Opportunity Today! Note: This stretch of beach will take you to the westernmost most point of Oregon at spectacular Cape Blanco itself! Leaving at 3 PM and continuing all the way to Cape Blanco will mean (at 2 miles per hour) a return time of approximately 8 PM, an real opportunity for a sunset beach ride! Access: Bandon State Park Day Use Area Directions: Travel about 3 miles south of Bandon along Highway 101 and turn west onto Beach Loop Road and about 1/4 mile after this road turns north access the first Bandon State Park Day Use Area on the south side of the road. Ride: "South & Back" a total of 10 miles roundtrip traveling 5 miles south until reaching the mouth of the New River, and return as you came another 5 miles. About 1 mile south of the access you will need to ford Twomile Creek to proceed to the New River another 4 miles, and ford it again on the way back. Note: This stretch of beach takes you along low dunes, crosses Twomile Creek, and is relatively isolated. Please also note that beach vehicles are permitted south of this day-use area. Access: Bullards Beach State Park Beach Access Parking Lot Directions: Access the beach at Bullards Beach State Park about 2 miles north of Bandon, and follow the park road out to the beach area where the parking lot is located. Ride: "North & Back" a total of 8 miles from the Beach Access Day Use Area, traveling 4 miles north along the beach to Whiskey Run Beach and Creek, and then return another 4 miles the way you came. You could also access the parking lot at Whiskey Run Beach and only travel 4 miles as a one-way ride "North" as well. Note: This stretch of beach takes you along dunes and low cliffs just north of the Coquille River. Perhaps having lunch for yourself where we will come out to access the beach is a good way to wait for the expeditions arrival this day. The parking lot at Whiskey Run is on a slope and may prove challenging or impossible to turn around a horse trailer, especially when full of cars and trucks in the summer, and thus could create difficulities for you to load or unload your horses here. Or Umpqua Beach Day Use Beach Access Parking Lots. Access: Horsfall Beach Access Parking Lot, US Forsest Service Oregon Dunes NRA Directions: Take Highway 101 and 0.3 miles north of the McCullough Bridge turn west onto a causeway road, travel about 1 mile, fork to the right to access the road leading into the Oregon Dunes National Recreation Area (NRA), and travel 2.5 miles to the beach access parking lot with restrooms. Access: Umpqua Beach Access Parking Lots Directions: Take Highway 101, turn west into Winchester Bay, travel the main road west and along the south side of the bay and marina area itself by Salmon Harbor, follow this paved road as it turns south paralelling the Umpqua River and you will come to the beach south of the jetty and various parking lots within the dunes themselves. Times to connect: 9 AM at Horsfall Beach Parking Lot, and 3 PM at the north bank of Tenmile Creek. OVERNIGHT HORSE CAMPING SITES: Oregon Dunes NRA, Wildmare Horsecamp - Some sites can be reserved. Call 1-877-444-6777 for information and to potentially make reservations. Note: This stretch of beach takes you along the dunes of the southern portion of the Oregon Dunes National Recreation Area. The beach area below Tenmile Creek also has access for motorized vehicles such as "dune buggies," ATV's, and motorcycles, therefore rider and horse should be prepared to deal with noise and fast moving vehicles. Above Tenmile Creek motorized vehicles are prohibited on the beach, but could potentially be seen and heard on the upper dunes the upper 3.5 miles nearest the Umpqua Beach Recreation Site to the south jetty of the Umpqua River itself. Also not that both the Horsfall Beach Parking Lot and the Umpqua Beach Parking Lots are staging areas for and accessible by motorized vehicles as well. Access: Sparrow Park Road Beach Access Area Directions: Take Highway 101 and about 2 miles north of Gardiner, Oregon turn west onto Sparrow Park Road, and follow this narrow unpaved road (not maintained) about 4 miles to the beach. The only way to park a horsetrailer here would be to drive out into a sandy area, just beyond the road loop area. Ride: "South & Back" traveling south about 1 mile below the access area and Threemile Creek to meet us somewhere on the beach, and then return 1 mile north to the access area. Note: This ride would require a great investment of time and energy to join us for only a short distance, and we could actually miss connecting with you if our passage over the dunes from the west bank of the Umpqua River brings us above where you could be waiting for us. Also, we might also arrive at the beach earlier than expected and miss connecting in terms of the actual meeting time expected for this day.